95% of all authors have to do the marketing for their books – even if they are the “lucky” ones who found a major, traditional publisher. Only celebrities and star-authors, such as James Patterson or Danielle Steel get publicity from their publishers. 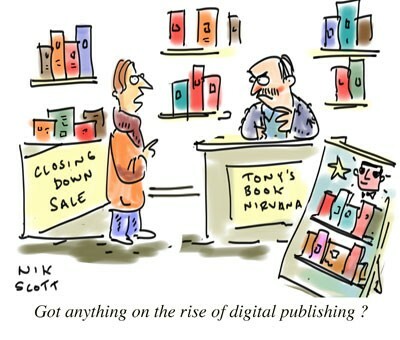 The question for authors is now: Why should they sell their manuscripts for a pittance to publishing houses at all, if these publishers are sending out a mass-press-release only and are otherwise not involved in the marketing part? What are they good for? Authors are smart and able to start their own publishing business, REAL publishing, not POD and not Vanity Publishing: Finding and getting quotes or referrals for an editor, a book lay-out company or book designer, cover artist, e-book formatting company and a printer is not difficult. is the work of a couple of days, researching all aspects of the publishing enterprise. for your print-version of the book is not a problem, distributors mostly require just three books to be listed as a publishing business, and if authors have not written three books yet, they can band together with other authors to reach this minimum. Aaron Shepard has written two books about the topic of book distribution: POD for Profit and Aiming at Amazon, both contain very detailed information for small publishers. Be careful when choosing a name for your book publishing company. Keep the name neutrally and usable in a variety of languages. Avoid your or your books name and survey several professionals for their input. Last but not least do a name check before your spend money on registering or using the name. for your book publishing business is preferable through your own savings. Try to find the most economical way to start your publishing business. Don’t order any print runs before you have substantial orders, rather go in the beginning with a recommendable POD, such as CreateSpace. In several countries, such as USA or Germany for example, financing the creation of books has become main stream. Kickstarter, IndiGoGo or STARTNEXT (German) are crowd funding sources, writers can use. In a former blog post we explained how to get an International Standard Book Number (ISBN) and bar codes in several countries. How to get into the “Books in Print”, the worldwide database and to register your book for FREE! with Bowker was the topic of other blog posts. https://savvybookwriters.wordpress.com/2011/08/31/important-expose-your-book-to-the-world/. However it is extremely important to choose the right genre (or several) in order for your books ranking, e.g. on Amazon. Check out a variety of online retailers to “put your eggs in many baskets”. and how to get relevant links are the topic of several former blog posts. To read them all just click on Website & SEO (28 articles!) on the right hand side of our blog. Advice and useful links for book layout, printing etc. Finding freelancers for editing, design, proofreading, webdesign etc. Re-blogging this article is encouraged, just use the tiny re-blog button on top of this page! If you enjoyed this blog post, please feel free to check out all previous posts of this blog (there are more than 720 of them : ) if you haven’t already. Why not sign up to receive them regularly by email? Just click on “Follow” in the upper line on each page – and then on “LIKE” next to it. There is also the “SHARE” button underneath each article where you can submit the article to Pinterest, Google+, Twitter, Chime.in, Facebook, Tumblr and StumpleUpon. This was a great blog. Thank you for your input. it is a series that includes tips on how to actually set up your publishing business, about book production, book distribution etc. and will continue Monday, November 25th, stay tuned. Great bog and most helpful! Thanks. I have one question: If I already have a company that is in a different field, IT, can I rebrand that company as a Publisher, or create a division for the publishing of my own ebooks, PODs? Absolutely fantastic! Exactly what I was looking for without knowing it!